← Should My Camera Selection Based on the Shooting Needs or Video Record Format? Summary: As a smart video editor, GoPro Studio provide a simple way to edit GoPro, Canon and Nikon video, however, many people still have the requirement on video editing in GoPro Studio, in this article I will show you put the multiple video clips together in GoPro Studio. GoPro Studio is smart video editor which makes it easier than ever to create professional-quality video with GoPro Hero Camera footages. GoPro Studio gives you plenty of useful editing tools in a really gorgeous package. It provides a simple way to import footage, speed it up or slow it down, crop, and make image adjustments (like removing the fisheye lens distortion, or adjusting color or contrast). Besides editing GoPro Hero Camera footages, GoPro Studio can also edit MOV video files from Canon and Nikon DSLRs. How to edit MOV/MP4 video files from GoPro, Canon and Nikon DSLRs in GoPro Studio on Windows and Mac. MP4 video files from the original HD Hero Original, HD Hero 2, HERO3, and HERO3+. MOV video files from Canon and Nikon DSLRs (except in Windows 8). JPG files from GoPro HD Hero, Hero 2 and Hero 3 cameras (.jpgs from other sources may work, but have not been tested nor are they officially supported). It shows that you can realize to edit MOV/MP4 video files from GoPro, Canon and Nikon DSLRs in GoPro Studio, if you still need to solve some MP4, MOV files fail to import to GoPro Studio issue in Windows/Mac, please make clear that you have imported the supported video type with the correct way. As we all know that the video recorded by GoPro, Canon and Nikon camera are storage in the SD card, and the GoPro Studio is not supported import the footage directly from an SD card. From the GoPro official site it clams supports GoPro, Canon, Nikon and other constant frame rate H.264 mp4 and .mov formats, how about the records in other codec, such as MXF, AVCHD? And the video storage in several clips, is there a simple way to merge the video clips into one files? In order to solve the issues we mentioned above, here I highly recommend you a professional video tool–Pavtube HD Video Converter for Mac(read the review). With it you can convert any video from GoPro, Canon and Nikon camera into GoPro Studio supported MP4 or MOV files. With just one click you can merge all the video clips into one file and then import the video into GoPro Studio edit as whole a one video. If you are a 100 percent windows user, please turn to Pavtube HD Video Converter, it has the same powerful ability as Mac version. In the rest of the article I will show you the step by step guide of how to put multiple video into GoPro Studio, in other word, the simple toturial will be showed. Just choose the right version and start your non-issue importing and editing with GoPro Studio. Step 1. Transfer files from camera to Mac computer. As we mentioned above, GoPro Studio are not supported directly imported from SD card. You should plug in your camera to the computer with the memory card inside via the USB cable, turn on the camera, then you can find your files, copy and parse them on your Mac hard drive. Step 2: Input Samsung NX1 H.265 files. 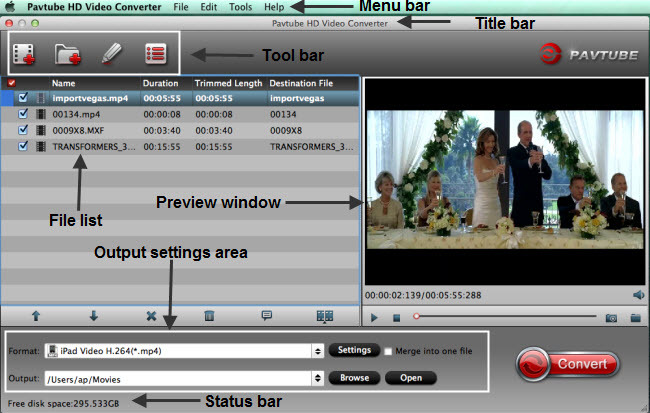 From “File” drop-down menu, select “Add Video/Audio” to import files to the software for conversion. Step 3: Specify output file format. Click “Format” bar, from its drop-down selection, define “MOV – QuickTime (*.mov)” as the output profile format. 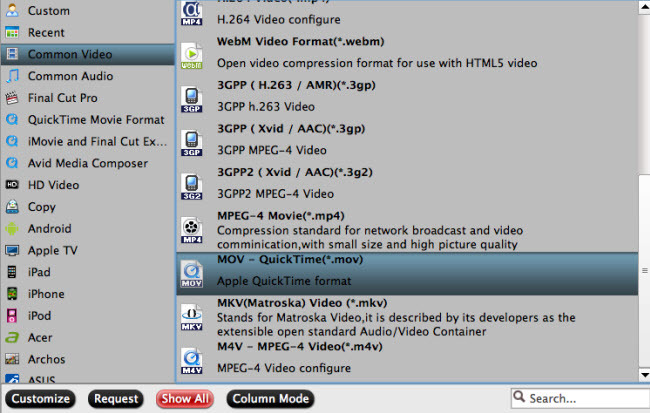 Step 4: Merge all video clips into one files and transcode files to QuickTime MOV format. Click the “merge into one file” and then carry out video to QuickTime Conversion process by clicking the right-bottom “Convert” button. When the conversion is over, click “Open” on the main interface to locate the converted files to transfer and import into the GoPro Studio without any problem. Add MOV, MKV, WMV, FLV, MP4 to GoPro Studio in Win/Mac?